Whichever way you wish to enjoy a night – sipping the world’s finest drinks in the finest of bars, having the best meals in choice restaurants, watching a Rock band play live, sitting amongst a refined audience soaking their souls with opera music, or even laughing with the audience to jokes of Comedians – Birmingham is the right place for you. The historic city sits in the heart of England in the Midlands area. It was a major canal hub during the industrial revolution, and it is currently the second largest and most populous British city after London, with a population of over 1,100,000. Birmingham is a bustling, lively city which guaranteed to satisfy the thirst and hunger of variety of people. The city offers some of the best nightlife in the UK, with a great assortment of bars, restaurants and pubs all collected near each other. Three Universities are connected to the city, providing a steady flow of easy-going, party-hard students crawling about the town. It is always easy to hire a taxi anywhere around the city centre for very little cost. No matter where you want to start, Birmingham will give you a memorable time. Here, there are star-filled theatres and comedy clubs, stylish bars and the hottest nightspots, allowing visitors to choose the exact Birmingham nightlife adventure that suits them. 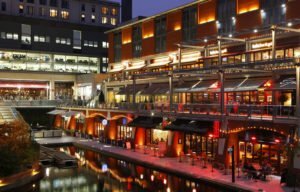 If you’re craving some fine choices in drinks for your first night in Birmingham, you can choose from the bustling Broad Street, svelte Mailbox, the ever vibrant Arcadian or the leafy suburbs, Birmingham pubs and bars will offer you the finest drinks in the world. If you love music and concerts, then Symphony Hall is built for you. The hall is widely regarded as the finest concert hall in Europe and with the Town Hall close by, it is in a magnificent location. Symphony Hall offers you the best classical, jazz and opera music performances. Hosting some of the great names in classical music, Symphony Hall is home to the City of Birmingham Symphony Orchestra (CBSO). Night after night, a constant stream of world famous rock and pop acts light up the stage at Arena Birmingham and the Genting Arena, just ten minutes away from the city centre. Coupled with the Bramall Music Building, Birmingham Hippodrome, O2 Academy, Jam house, and other smaller venues, Birmingham is your perfect hub of music. And why wouldn’t it be? Birmingham is also the birthplace of heavy metal music, pioneered and created by the local band, Black Sabbath. If laughter and great jokes are on the menu, then The Glee invites you to come have a bellyful of it. This is one of the rare venues where you can get great food, drinks and a guaranteed laugh. The award winning venue with its unique and intimate atmosphere has seen almost every top comedian perform on its stage, ranging from Jack Dee to Jimmy Carr. You want to make it a date with The Glee every Thursday, Friday and Saturday night. Birmingham nightlife is the finest in the United Kingdom, with lots to choose from and a venue for everyone.